To become a Renowned Importer and Distributor known for performance, reliability, professional standards and respect. Food and beverage manufacturers are increasingly seeking alternative sweetness enhancer solutions as tools to naturally reduce costs associated with sugar application and reduce calories. To meet this demand for alternative, FADAK has been on a constant look out for a Sugar Alternative solution that can reduce production costs of food manufacturers. We have recently signed a strategic partnership with a global market leader based in Malaysia who produces sugar alternative in the name of ‘PURA SWEET’ by using Australian technology. Pura Sweet replacement solution is designed to work well in enhancing flavor, sugar like sweetness, preserving high heat stability, and taste profile of food and beverages at a low cost while reducing calories in the recipe. Pura Sweet is Five (5 ) times powerful than normal Sugar. 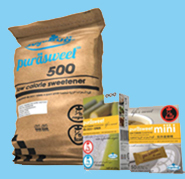 Means 1 KG Pura sweet is equivalent to 5 KG normal Sugar in application. Pura Sweet is 99 % Natural sugar.